I will break up the strategy into these four phases in order to explain what happens at each one. The Strategy (m): One person will need to guard the I.K.S. Kang (Kang Guard) while the other four people destroy everything else (Attackers). The Kang Guard will need to move back and forth between the left and right cubes, and defeat any borg ships that appear there. The Attackers will start at the middle cube and destroy all six probes starting with the lowest three. They will also need to destroy any Borg ships that appear in order to help defend the I.K.S. Kang. The Strategy (r): The Kang Guard will now move back and forth between the left and middle cube still destroying the ships. The Attackers will move to the right cube and destroy all the probes as well as any ships that appear. Once all six probes are destroyed they can destroy the right cube. As soon as the right cube is destroyed they should move back to the middle cube. The Strategy (m): Back at the middle cube, the Attackers should destroy all the ships that appear. One Attacker may have to help the Kang Guard defeat any ships that have come from the left cube. Once all the middle ships are destroyed, the Attackers can destroy the middle cube. The Strategy (l):At this point we have completely destroyed the middle and right cubes, so all 5 players can now move to the left cube. Everyone will need to work together in order to destroy any ships that appear, the left probes, and the left cube. After all of them are destroyed one person should rush back to the I.K.S. Kang and hail it so it can warp out. There is also an optional objective in which you must complete the entire mission in 15 minutes and the hull strength of the I.K.S. Kang should not drop below 75%. Completeing the optional objective will earn you a bonus reward which will appear at the spot where the I.K.S. Kang is. After the I.K.S. Kang has warped out, an assimilated Klingon Carrier will warp in. Just have your team focus all fire on it until it is destroyed. Congratulations! On the Vorn planet you you will need to disable the nearby shield which is blocking your path. First, go to the right of the shield where you will see a console which you will need to scan this first. There are three Borg transformers here. Go to the furthest one (away from the shield you are disabling) and reconfigure it. You will notice a progress bar appear above it. If this bar empties out then you will need to start over. Before I go any further let me explain the different roles that players will have to take. You and your team must decide who does what. Planter - plant the mines on the turret. Floater 2 - Help defend nodes 3 and 4. Tell the team when the shield has dropped. After a little while a beam will shoot out to the next transformer. Go to it and reconfigure that as well. Repeat this until all of the transformers have been reconfigured. The last one will shoot out a beam that will destroy the console and lower the shield. This is something that will be done a few times through the mission. Go down the path and defeat the Borg. Along here you will need to free four Klingon captives which are in Borg holding cells, and collect four genetic samples from Klingons which are laying on the ground. You'll find the first of these right away. To free the Klingon use the console near him. I suggest doing this right away so he can help with the battle. Also, in this area, don't get too close to path by the water. The trigger to start the optional timer is around here and you don't want it to begin too early. When the team is ready head down this path to the turret with the shield around it. One person on your team should be designated as the Planter. This person will plant a mine on the turret when the large shield drops. Attack the turret until the shield drops. Other shields will appear with openings in between. The Planter will get next to the turret and plant a mine. Once it is planted you can move on. Keep going through the map until you reach an area with some nodes and a turret. You can't continue because at the other end is a large shield blocking your path which you need to take down. Begin by killing the Borg which are patrolling the area. At this point different people will have to take on different rolls which should be decided before starting. I'll explain them then continue the walkthrough. Defender 1 - This person stays at node 1 and defends it. Defender 2 - This person stays at node 2 and defends it. Defender 3 - This person stays at node 3 and defends it. Floater 1 - This person helps defend nodes 1 and 2. Floater 2 - This person helps defend nodes 3 and 4. Defender 1 goes to the first node and overloads it which causes the turret to turn on. Attack the turret and then have the Planter get close and plant the mine. Once it is planted everyone can move to the second node while Defender 1 and Floater 1 defend Node 1. Borg will beam in to try and repair the nodes so you must keep them away. Pulse rifles are good for this as well as hitting them with your weapon's melee attack. It is also a good idea to spawn everything you have. Now overload Node 2, then 3, then 4. Make sure you are defending the correct nodes. If you are Floater 2, tell the rest of the team when the shield is down. If any of the nodes are repaired the entire thing will reset and you will need to start over. After the shield is down you can continue on. Keep traveling along, rescue the Klingon captives and get the genetic samples. You will eventually reach another spot with the nodes. You need to repeat what you just did in this new location. I won't go through the strategy again because it is the same. Now that you have gone through both of these points, continue straight down the path. There will be another group of Borg and one more turret. By destroying this turret (and still have time remaining) you will get the optional objective. Either way, it must be destroyed. Now make a left and head down this next path. 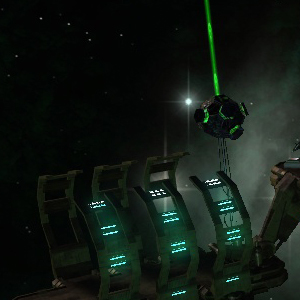 At the end of the path you will find Borg, four backup generators and a main shield generator. At this point you can pull out your sniper and head up the mountain to your left. 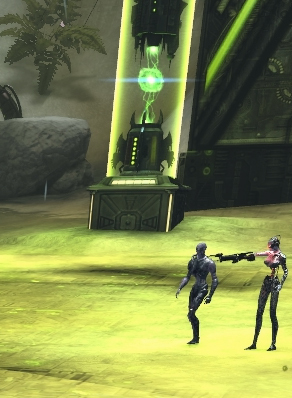 From here you can snipe the Borg without them really being able to hurt you. That is only an optional strategy, you don't need to do it. You should also spawn anything you have which can help. Once all of the Borg are dead destroy the four backup generators then the main one in the center. Now go back the way you came, but instead of making a right (towards where the turret was) keep going straight. 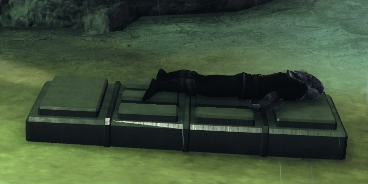 Here you will find Armek of Borg, the boss of the area. The strategy is fairly simple. Get your pulsewave weapons and have the entire team stand right up against him. Don't leave any space, just stand on him. As soonas you can, start attacking him. Don't move away, just stand there and attack until he is dead. If someone on your team dies, leave them be. You can heal them after. After Armek is defeated you can collect your reward. Congratulations!